Time sure has flown by on this trip. 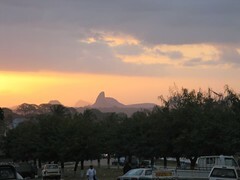 I am in Nampula, with two days left here before I fly to Maputo on Wed and then start the long journey home on Thurs. My flight out of Nampula was originally booked for Thursday morning, leaving only 1.5 h between arriving in Maputo and leaving for Jo’burg, which I have learned since being here is definitely not enough. Local flights don’t ever seem to leave on time, and two of my colleagues have been delayed by more than 6 hours. One was supposed to leave Nampula at 1pm or so, but the flight was overbooked so she was put on the next flight, which was supposed to leave at 8pm. It probably left late and had a supposedly short stopover in another city before heading to Maputo. That stopover ended up being most of the night and the passengers all had to stay in the airport. Please all keep your fingers crossed that might 2 hour flight is only two hours! Sunday afternoon is a time when many Mozambicans head out to see their local teams play some football. Today, I joined two Mozambican colleagues and my Canadian boss to go see a game here in Nampula. 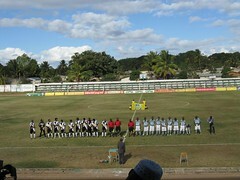 One of the teams was from Maputo and the other was a local team from Nacala, which is about 2 hours away from Nampula. The game was played at the local stadium, which I would compare to what you would find behind a high school in Canada. We each paid about $3 to get in and the place was packed. I’ve been here for nearly a month now and thought it was about time I write about Mozambique itself. Mozambique is located on the south-east coast of Africa, just above South Africa and below Tanzania (check out the map I’ve posted on flickr). I am currently in Nampula, which is in the north of the country, about 3 hours inland from the coast and a 2.5 hr flight from the capital, Maputo. Pemba, which we visited a week ago, is further north on the coast. 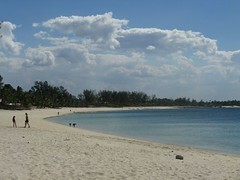 Mozambique has a total population of 21.4 million and the official language is Portuguese (one of 5 African countries). It is a former Portuguese colony and Portuguese traditions and culinary tastes still remain. It gained independence from Portugal in 1975. Time is flying by here in Nampula. Another week has disappeared into a haze already. This is both good and bad. Good because it means that I will be home soon and the time between now and then will likely continue to pass quickly, but bad because there remains a lot of work to be done between now and then. Part of the reason why this week went by so quickly is because we had to go to Pemba, which is the capital of the province of Cabo Delgado, the other province where this project will be working (the other being Nampula). Well, another week has come and gone and I did not find any time to write a blog update. Now that it is Saturday, things on the work front have calmed down a bit, not because there is no work to be done, so I can finally write a brief update of what I’ve been up to. My time in Mozambique is flying by, mostly as a result of the amount of work there is to do. We are making progress and getting things done but it doesn’t leave much time for tourism or even getting out of the hotel! I have been able to post some photos. I labelled them as best I could, considering I could not see the photos once uploaded! Here is a link to a random one (I have no idea which one it actually is) - hope it's a nice one! Click on it and follow the link to see them all. Today (June 25th, as I will be posting this later) marks the 34th anniversary of Mozambique’s independence. This is when the country gained independence from its Portugual. It is a national holiday, as Canada Day is at home. There was a small parade this morning in Nampula. It looked to be only school children. We decided to take the day off like everyone else seeing as everything was closed and we wouldn’t be able to get much done anyway. That, coupled with the fact that the internet has been down for 2 days means there’s a lot that could not get done today anyway. After spending the weekend in Maputo, I flew up to Nampula, which is in the North of Mozambique. It is a city of approximately 300-400,000 people, with a small commercial centre. According to one of the women I am traveling with it has changed a great deal since 1995 when she was last here. It is a bustling little city now. It is warmer here than it was in Maputo, as we are closer to the equator. During the day it is hot, while at night a nice cool breeze blows. It reminds me of Ottawa in July. It’s the dry season now, so we should get much rain while I am here. I will be very happy, once I am in Nampula on Monday, not to see an airport for a while. I am currently in Johannesburg, South Africa, where I am staying for two nights on my way to Mozambique. I flew via Toronto and Amsterdam yesterday to arrive here around 9pm at night. Unfortunately my checked bag did not make it on the same flight from Amsterdam. Otherwise, the flights were uneventful and I was happy to have a bed last night, even though it wasn’t for very long (6 hours by the time I got to the hotel).